Some 10,000 water protectors in camps at Standing Rock, North Dakota and supporters worldwide claimed a victory after Pres. Barack Obama halted construction of the Dakota Access Pipeline (DAPL). Jo-Ellen Darcy, the Army’s Assistant Secretary for Civil Works announced the Department of Army would not approve an easement allowing the pipeline to cross under Lake Oahe. She said there is a need to explore alternate routes, as well as an environment impact study on how the 1,172 mile $3.8 billion pipeline would affect the Standing Rock Sioux Tribe. The Tribe heavily relies on the lake and Missouri River for drinking water. Darcy’s office had announced on November 14, 2016 that it was delaying the decision on the easement to allow for discussions with the Standing Rock Sioux Tribe, whose reservation lies 0.5 miles south of the proposed crossing, the Army has reported. Dave Archambault, II., chairman of the Standing Rock Sioux Tribe, said it will be forever grateful to the Obama Administration for the historic decision. “We want to thank everyone who played a role in advocating for this cause. We thank the tribal youth who initiated this movement. We thank the millions of people around the globe who expressed support for our cause. 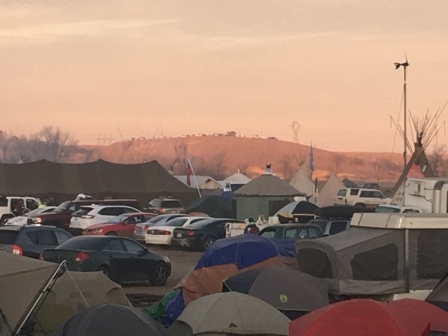 We thank the thousands of people who came to the camps to support us, and the tens of thousands who donated time, talent, and money to our efforts to stand against this pipeline in the name of protecting our water,” Archambault said in a statement posted to the Tribe’s website, StandWithStandingRock.net. “We especially thank all of the other tribal nations and jurisdictions who stood in solidarity with us, and we stand ready to stand with you if and when your people are in need,” he continued. Throughout the effort, Archam­bault stressed the importance of acting at all times in a peaceful and prayerful manner, and that is how they will respond to the decision, he said. The Tribe and supporters looked forward to being able to return home and spend the winter with their families and loved ones, and celebrating, but many people vowed not to leave the camps. The first, Sacred Stone Camp, was established in April on the land of Ladonna Brave Bull Allard, a Standing Rock Sioux historian. The other, Oceti Sakowin Camp, also known as the “Big Camp,” was established as hundreds of tribal nations and worldwide supporters, descended Standing Rock to help protect the water. That included 2,000 of veterans who were still making their way to Standing Rock at press time. “I think the war has just begun,” Allard stated. “Everybody’s getting ready to march and stand up. Indian people, we already know. We’ve been through this 500 times. We know they lie. We trust no one. We have a long history of not trusting,” she stated. She stated DAPL workers never stopped working and vowed to continue. Indeed. Energy Transfer Part­ners and Sunoco Logistics Partners openly defied the Obama Admini­stration’s decision, and announced in a press statement that it would keep constructing the pipeline. “In spite of consistently stating at every turn that the permit for the crossing of the Missouri River at Lake Oahe granted in July 2016, comported with all legal requirements, including the use of an environmental assessment, rather than an environmental impact statement, the Army Corps now seeks to engage in additional review and analysis of alternative locations for the pipeline,” read the companies’ joint press statement. “The White House’s directive today to the Corps for further delay is just the latest in a series of overt and transparent political actions by an administration which has abandoned the rule of law in favor of currying favor with a narrow and extreme political constituency,” the document continued. The Dakota Access Pipeline would connect the Bakken and Three Forks oil production areas in North Dakota to an existing crude oil terminal near Pakota, Illinois, according to the Army. It’s projected to transport approximately 470,000 barrels of oil per day, with a capacity as high as 570,000 barrels. 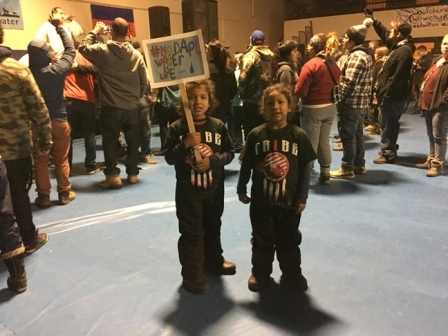 Approximately 200 Native tribes and tens of hundreds of environmentalists and activists united to protest (self-dubbed ‘water protectors’) the pipeline. It would be detrimental to their food and water, the Natives argued. They’ve been met by brutal law enforcement and private security forces who’ve unleashed police dogs on unarmed men, women and children, pepper spray, concussion grenades, and water cannons in sub-freezing temperatures. In September, the Standing Rock Sioux sued the U.S. Army Corps of Engineers to block the operation of Corps permitting for the Dakota Access Pipeline, saying it improperly granted permits, but was denied. The construction, which runs within half a mile of its reservation in North and South Dakota, would destroy sites of cultural and historical significance, the Tribe further argued. And it has, according to Allard. 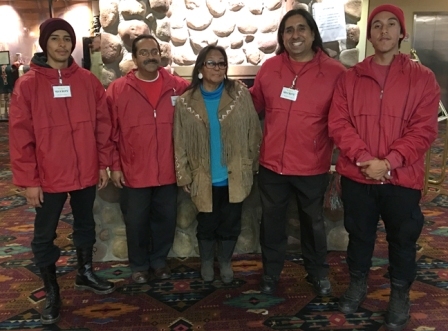 DAPL workers have desecrated 380 sacred sites, including the burial sites of her son and others, she said during a Mni Wiconi (Water is Life) Benefit panel discussion held to raise money for the Tribe’s legal fees on Nov. 25. Allard’s been on the ground for more then eight months now. She was compelled to get involved because of what was happening to her son’s grave, she said. 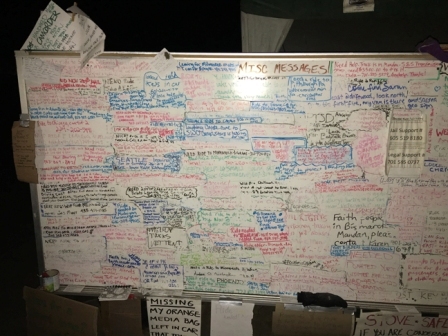 “What happened at the camp was the youth became the leaders…They stood up…The youth is who people listened to … They are who understood what was happening more than we did. They are our leaders,” Allard stated. David Walker, Standing Rock Sioux Tribal Councilman at Large said the Dec. 4 announcement by Darcy was good, not only for tribal people, but for all people. “We all don't have all the answers, but for today, we can rest our heads knowing that our voices were heard. We raised our voices up through the direction of our ancestors. Through prayer and our spirituality, we were given guidance to raise our voices and raise awareness and to be acknowledged from the most powerful person in the free world, Pres. Obama and his administration, that in itself says a lot,” Walker stated.